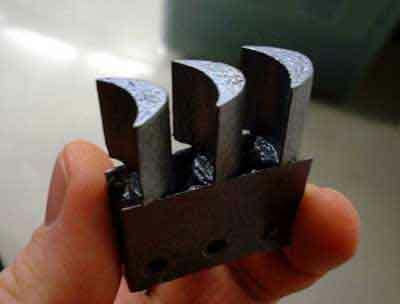 When a flat plate is sliced through the air at a slight upward angle, the air below is pushed downward generating an upward force, called lift. This is a simple wing. Unfortunately a flat wing like this generates air turbulence above and behind, which slows it down and greatly reducing the lift. 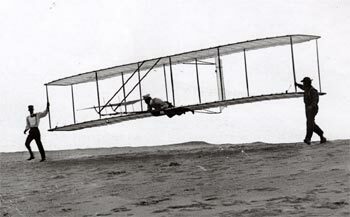 Here we see the American Wright brothers in 1903 experimenting with a glider. They were bicycle makers, and made the first successful aeroplane, after years of trial and error. Many other people had managed to fly before this, however none of them were able to properly control their machines, or generate enough power to stay in the air for more than a few seconds. They designed and built one of the first wind tunnels to carefully test their ideas, such as the shape of the wing. Their early wings were thin but slightly curved. It was a great improvement, but was fragile, it needed wires and external ribs to support it. Here we see an example of this from World War 1. This fighter has thin wings, and many wires and struts to add strength. Unfortunately even a thin wire or strut creates turbulence, causing the plane to fly slower. This negative force pulling the plane back, is called drag. The fixed undercarriage that you see here, created considerable drag. The gunner can be seen sitting up high, and the pilots' head is also visible. This added to the drag, and for many years, pilots sat in open cockpits. They believed that unless they could feel the wind, you couldn't fly safely. Early aeroplanes had been flying for some years before it was realised that air moving over the top of the wing generates about three times more lift than the air flowing under it. By building a thicker wing, the supporting ribs could be hidden inside the wing, making it stronger, while giving a smoother flow of air, and very little turbulence. Most aircraft today have a wing which is curved on the top surface, and nearly flat underneath. This is a Mustang fighter, from World War II. Notice there are no struts or wires. Modern, fast aircraft are able to fold the landing wheels neatly into the body out of the airflow (the slipstream). This is known as a retractable undercarriage. Of course the pilot must now not forget to lower it before landing. 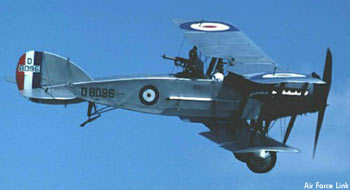 The guns are built into the wings, and the pilot is in an enclosed cockpit. All this greatly reduces the drag and allows the plane to fly much faster, without extra power. You can easily show how lift is made with a simple experiment using a large piece of paper. Hold one end of a page so that it droops into a curve. Then try blowing over the top of the page and see which way the page moves. There's more to an aeroplane than just a wing. You need to pull the aeroplane through the air in order to get the air flowing past the wing. You need a light powerful engine driving a propellor. 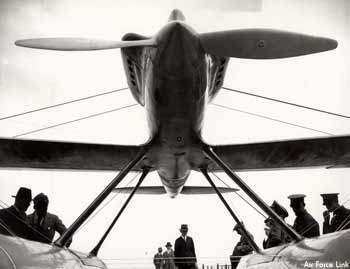 Here we see the large propellor on an early racing seaplane. It won the Schneider Trophy, in about 1925. The propellor shape is similar to that of a wing, however it has a twist built into it. Imagine the propellor spinning. The tips would be travelling very fast, while the part near the axle, much slower. By building in a twist, it means that all the air being blown back, moves at roughly the same speed. From the aircraft above developed the successful Supermarine Spitfire, a fighter plane used to great effect by Britain not long after World War II started in 1939. The air flowing back behind the propellor, does not travel straight but in a slight spiral, due to the spin of the propellor. This spin can cause the plane to turn or roll slightly if the engine power is reduced or increased, and is a problem for both aeronautical engineers, and pilots. 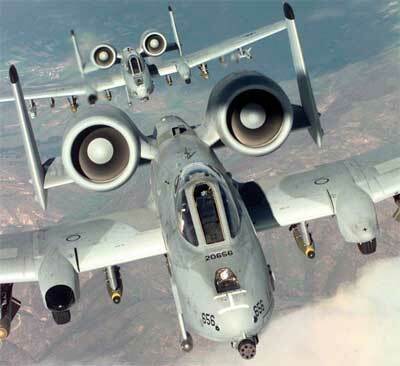 The engines on British aircraft rotate one way, American aircraft the other, which means the effect changes too. This Sikorsky machine has 3 rotor blades. As they spin, they generate lift, however once in the air, the engine is now connected to a flying machine. The entire body of the machine starts to spin in the opposite direction. Next time you hold an electric drill, notice how it tries to turn in your hand when you turn it on. It's the same kind of reactive force. There are a few (very few), helicopters with two sets of rotors, one above the other. By spinning the rotors in opposite directions, these forces can be balanced out. Most machines however use a tail rotor, like the one here. This can not only stop the rotation, but act as a rudder to turn the machine left or right. These may look like little wings, they are actually a few samples of rotor blades used on helicopters. The blades are connected to an axle, and to make the machine fly forward, the whole axle tilts forward, meaning that the rotor is not just lifting, but pulling the helicopter forward. This creates another problem, because now the blades on one side are advancing through the air generating extra lift, while on the other side, they are retreating, and generating less lift. The helicopter would roll over and crash. Fortunately, these blades not only spin, but are made to alter their angle to the air (the angle of attack) during each rotation. This reduces the lift on one side and raises it on the other. 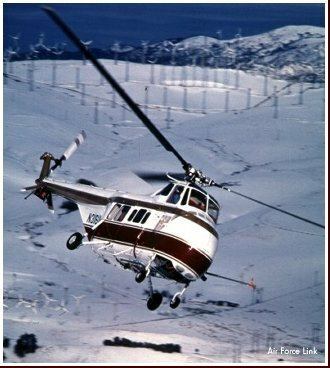 Helicopters are complex machines, and it took many years to develop them into safe reliable machines. They have many moving parts, and need more maintenance than others. This is one reason why helicopters are expensive to buy and run. 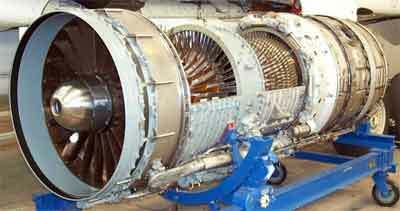 If we look at the front of a jet engine, we can see a set of large turbine blades. The air is sucked into the front opening, where, it passes through several rows of turbine blades which compress it. At this point, fuel is sprayed into it, and mixed to make a very inflammable mixture. It is ignited, which makes the air expand enormously. This expanding air can only escape by racing out the back. It passes through a small turbine on the way, and with such speed and energy that it actually drives the forward compressor. The reaction to this jet of hot air, pushes the aeroplane forward. The above cutaway view of a Concorde's Olympus engine gives us a look at some of these hundreds of turbine blades, we can see that they too, look like little wings. Their effect on the air is much the same as a wing. These A10 fighters have large jet engines, and this view shows the hot air from the engines causing distortion to the image behind. The aircraft is designed to fly fairly slow. That's why it has a wide thick wing for more lift. They also make it harder for heat-seeking missiles to actually detect the engine heat.